We don’t usually drink on a Monday, but decided to break the routine for the sake of some made-up anniversary, and heading off to The Salt Room in Brighton for a BYO dinner. 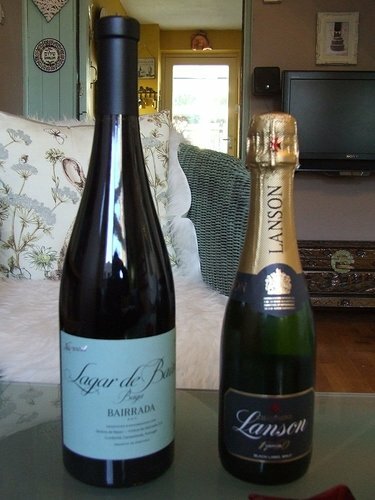 A half bottle of Lanson Black Label to start the proceedings, and then a Niepoort offering- 2014 Lagar de Baixo, a 100% Baga, and a lovely wine indeed. It’s a light-ish red, so should go with either meat or fish - so we’re not too restricted on the mains options. Limited headache guaranteed, too! Enjoy @Inbar menu looks great. The wine would be gone before I had chosen my meal. 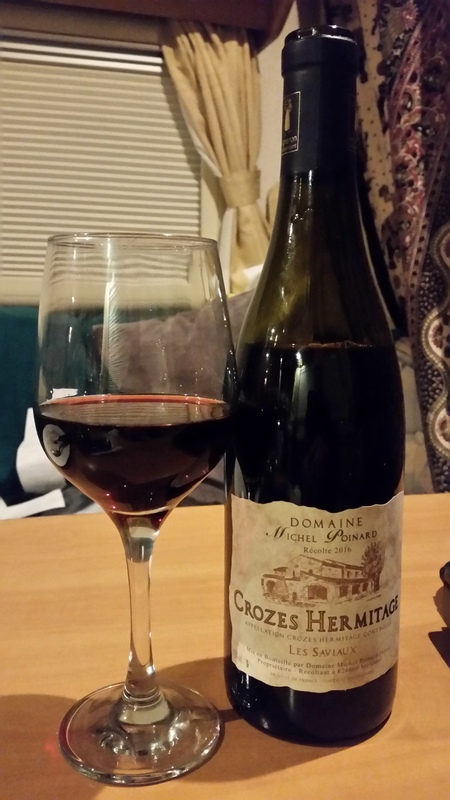 Fairly typical for French supermarket bought mid to low priced wine (around £10) this is probably way too young. However it is very pleasant and I suspect will probably be more so tomorrow after it’s been open for a while. Aromas of tar, herbs, spices and slightly sharp blackcurrant. Pepper dominates the taste pushing the fruit into the background. Being very young the tannins are quite pronounced but not overpowering and a long peppery finish. Not the best Crozes I’ve had but pretty good for the price. Not as smooth as the very nice mondeuse I finished off just prior to this glass. 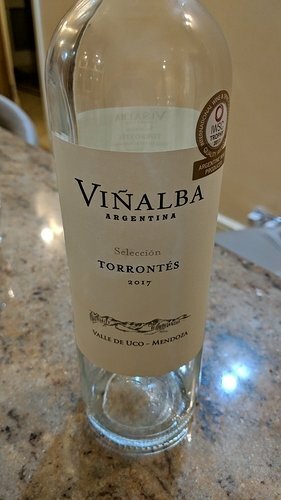 Wasn’t expecting that much at around £10 from Majestic, but it was thoroughly pleasant with tropical fruit and citrus notes. @NickP would love a Guinness in Ireland right now! Enjoy! No wine for me tonight either, but I did buy a bottle of The Society’s London Dry Gin at the weekend. It’s had brilliant reviews so I wanted to give it a try, has anyone else tried it? I’m looking forward to tasting it! 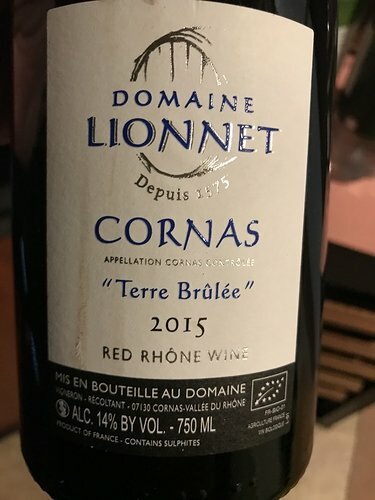 But on a different note picked this up and haven’t opened it yet… what do all the Rhône fans know about Dom Lionnet? 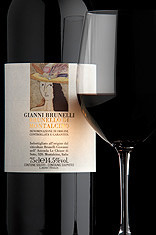 Absolutely delicious Brunello with depth of naturally sweet fruit and great finesse, as well as power. Now–2018. Hope so keep us posted on the outcome…,what cam next? Now that’s an anniversary tradition I could get on board with!! Nothing, but good reviews from a quick search! Probably far too young atm though. I got a response - it doesn’t (3 months too late! Rats). I have to say I’m a bit disappointed in this. It’s one thing for the wine to be too old and over the hill, and my fault for waiting too long, but TCA would have been present in the bottle throughout the wine’s life, so it’s faulty whenever I open it. Perhaps this is why TWS drinking windows are so conservative, insurance policy? That’s what I figured. Corked is corked; the drinking window is irrelevant. That’s a little harsh. Perhaps this is why TWS drinking windows are so conservative, insurance policy? Yeah, I always thought there was a link between the narrow drinking windows and the money-back promise, which is understandable I guess. I suppose maybe they have to be strict to avoid a TCA-friendly loophole in their refund policy. The most annoying thing is that the other 9 have been ok so far, and assuming the final 2 are, it was luck of the draw as to when I opened the corked bottle. After a certain price point it’s a bit jarring. Are you insinuating that TWS are lacking in their duty and professional competence by not catering to the smallest whim of every member, on a site that is really for member to member chat and not official complaints or queries? Not really, just that i’m disappointed a faulty wine isn’t refunded. I’d happily send the bottle over for them to confirm the fault, but I’ll probably survive. The Thalabert I opened instead was compensaion of sorts. Sorry about that, I actually feel your pain. I would not be happy either. Shell-on king prawns + sardines and salad are on the menu tonight. No albarino, vinho verde, muscadet, etc in the cupboard though. What else might fit the bill ? ( link didn’t work here ) . Ended up choosing a bottle of a Languedoc white, a bourboulenc, Les Terres Salees 2015, Domaine Simmonet. Described as full bodied, fresh, with a distinct salty tang. However, there is also a big hit of vanilla oak. Fine if I was having sauced white fish maybe but definitely not one for prawns or sardines !